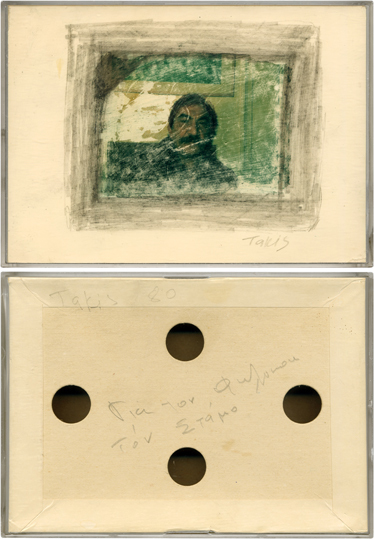 CM: Takis Efstathiou's Portrait of Theodoros Stamos is an experimental work using experimentally a Polaroid camera in keeping with the work of Lucas Samaras (b. 1936). After photographing the painter at Ericson Gallery in New York, Efstathiou separated the instant film's layers and used the ink remaining on the negative to transfer the image on plain paper. Subsequently, he intervened with pencil to enhance the portrait's features and provide it with a frame. It is important to note that with work such as this Efstathiou influenced Michael Landis, Voice of America director of production, to do his own original experimentations with Polaroid.